Organized like NFPA 101®, Life Safety Code®, NFPA 150 is the only code to address the life safety needs of animals. Developed after a series of disastrous fires in racetrack stables, NFPA 150, Fire and Life Safety in Animal Housing Facilities Code helps users evaluate the physical setting of both human and animal occupants and their level of protection in case of a fire. 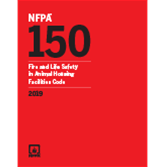 For the 2019 edition, NFPA 150 has been rewritten and changed from a standard to a code, with a layout similar to NFPA 101, Life Safety Code. The new Fire and Life Safety in Animal Housing Facilities Code presents core and occupancy chapters and includes seven new animal categories, some broken down further into subcategories, each with requirements tailored to the facilities' specific hazards and safety needs. Every aspect of fire and life safety is covered for animals in any type of animal housing facility. NFPA 150 is critical for protecting animals wherever they are kept for any purpose. Interested in other editions of NFPA 150? Use the drop down menu above to select the edition year you need. 4.2 Fundamental Fire and Life Safety Requirements. 6.2 Animal Housing Facility Categories. 7.2 Height and Area Requirements. 7.3 Stall, Cage, and Enclosure Requirements. 7.6 Fire-Rated Separations Between Animal Housing Facilities and Hazardous Areas. 7.7 Wildland/Urban Interface or Wildland/Urban Intermix. 8.2 Means of Egress Components. 8.3 Number of Means of Egress. 9.3 Fire Detection, Alarm, and Communication Systems. 9.15 Protection from Vehicle Damage. 11.2 Means of Egress Requirements. 20.4 Performance-Based Design Characteristics and Assumptions. 20.6 Evaluation of Proposed Designs. NFPA 150 addresses every aspect of fire and life safety for animals in any type of animal housing facility. NFPA 150, Standard on Fire and Life Safety in Animal Housing Facilities is the industry benchmark for evaluating the physical setting of both human and animal occupants and their level of protection in case of a fire event. Because current building, fire, and life safety codes do not address the life safety needs of animals, using NFPA 150 is critical for protecting animals wherever they are kept for any purpose. This Standard presents fire protection and fire safety mitigation measures that can be used in a variety of settings and environments, including barns, stables, kennels, animal shelters, veterinary facilities, zoos, laboratories, and racetracks. NFPA 150 addresses dependencies through a combination of requirements for active protection systems such as automatic sprinkler systems and fire alarms, control of building construction and interior finish types, and emergency plans to assist with relocation or evacuation of the animals if needed.